Taffy always seemed to me like one of those foods you either really liked or you were totally "meh" about. I didn't actively hate the stuff, but it would definitely be the last candy left in my Halloween bag. There were different brands. Bonomo's Turkish Taffy was one, and now it's back! Laffy Taffy is a Willy Wonka variety. Saltwater taffy rarely has a cool brand name or wrapper, comes in a lot of different flavors, and is often sold at beaches, boardwalks or fairs. At the Minnesota State Fair, there is a famous booth right outside the Food Building where you can see it being made, and there is a weird little statue of a chef pulling it. He's kind of falling apart, and one year his head fell off, but he kept on stretching the taffy. Abba Zabba, which I never heard of before marrying my Los Angeles born-and-raised husband, is kind of like taffy with sand in it. Charleston Chew is pretty taffy-like. 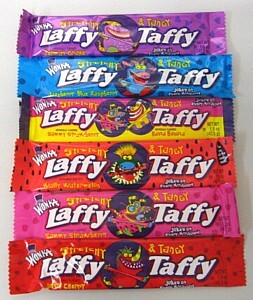 Tangy Taffy has apparently been completely replaced by Laffy Taffy, but long ago, they had a deal with Archie Comics. A Web reference I found says "Archie was cherry, Betty was banana, Reggie was chocolate, Veronica was strawberry, Hot Dog was vanilla and Jughead was grape." However, these boxes seem to say Veronica was vanilla. Which taffys do you remember? I never liked taffy, except for Charleston Chew-we liked to freeze them, it was totally different from eating a room temperature one. Oddly, this is the second reference to Abba-Zabba bars in the last couple of days. A 7-Eleven near me carries them, along with other oddball candy bars like Big Hunks, U-NO, Sky Bar, and....Charleston Chews! I'd never heard of most of them so I looked them up and bought a few.